The members are designed to withstand safely all loads liable to act on it throughout its life using the limit state of collapse. The members are designed to withstand safely all loads liable to act on it throughout its life using the limit state of collapse. These members designed should also satisfy the serviceability limit states. To satisfy the serviceability requirements the deflections and cracking in the member should not be excessive and shall be less than the permissible values. Apart from this the other limit states are that of the durability and vibrations. Excessive values beyond this limit state spoil the appearance of the structure and affect the partition walls, flooring etc. This will cause the user discomfort and the structure is said to be unfit for use. 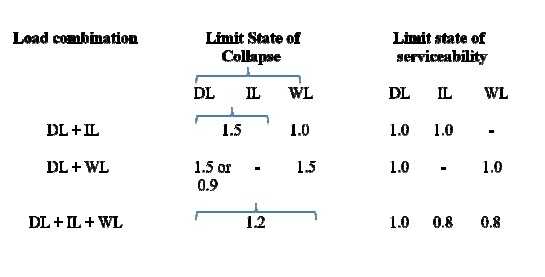 The different load comb inations and the corresponding partial safety factors to be used for the limit state of serviceability are given in Table 18 of IS 456:2000.